Kentucky Derby comes every year on the first Saturday in May. The best 3-year-old colts (boy horses for you lovely newbies) step out on the dirt track at Churchill Downs and compete for the most prestigious horse racing title in the world. This is the race everyone wants to win….and out of 4,000 horses born each year in the United States, only 20 of them make it to the race and only 1 victor. How’s that for an exciting 2 minutes…. Of those two minutes….there is another 6+ hours of a fabulous raceday that you are planning for. Why do we dress up? Well, first and foremost- its tradition! Horse racing and fashion have gone hand in hand for centuries. During the Great Depression, two things still flourished- movies and horse racing. It provided an escape from everyday life…the movies- a blackout experience where you could step away from reality and into the creative minds of writers and directors to follow along with someone elses life and story. The horse races provided another experience. You could dress up and feel like a King or Queen for a day, betting low dollars on high dollar ponies and enjoying a drink or two with your friends. The movies have changed a bit….but horse racing really has stayed quite the same. 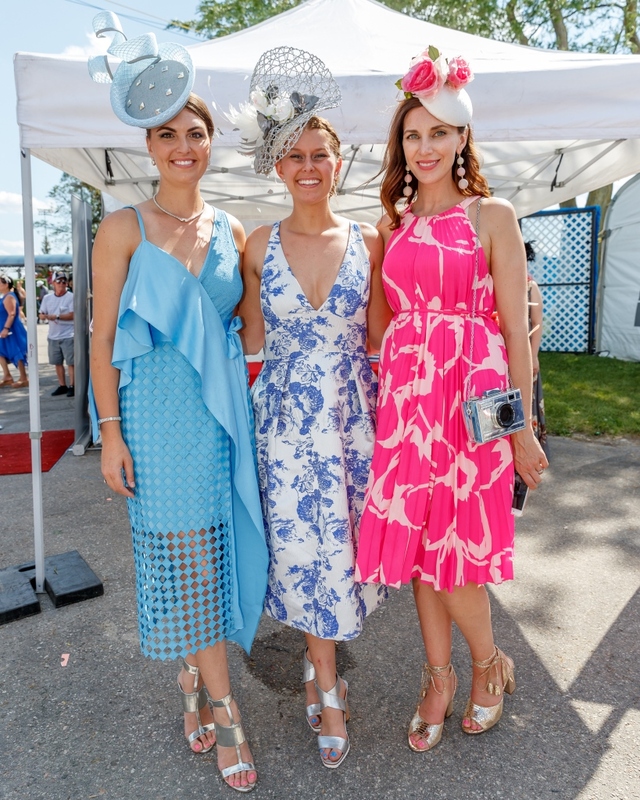 You can still dress yourself up, head to the track, be a King or Queen for the day betting low (or high) dollars on some amazing equine athletes. Of course a cocktail or two are in order as well. HAT: When you think of the Derby you think big hats with lots of decorations. If that is your style…go for it! However if you are on the fence- my caution is usually a big hat can get in the way of a big day. They can be heavy and hot. If you want to go for a brimmed piece, have the brim stay smaller than your shoulder width. Make sure the weight feels comfortable the instant you put it on. If you want something light and fun yet still fashion forward, look for a fascinator. You’ll want one with an elastic band or a headband for comfort. Make sure the headband is more than just metal and sits comfortable. Go for feminine colors! Bright happy spring colors- reds, pinks, yellows, oranges etc. 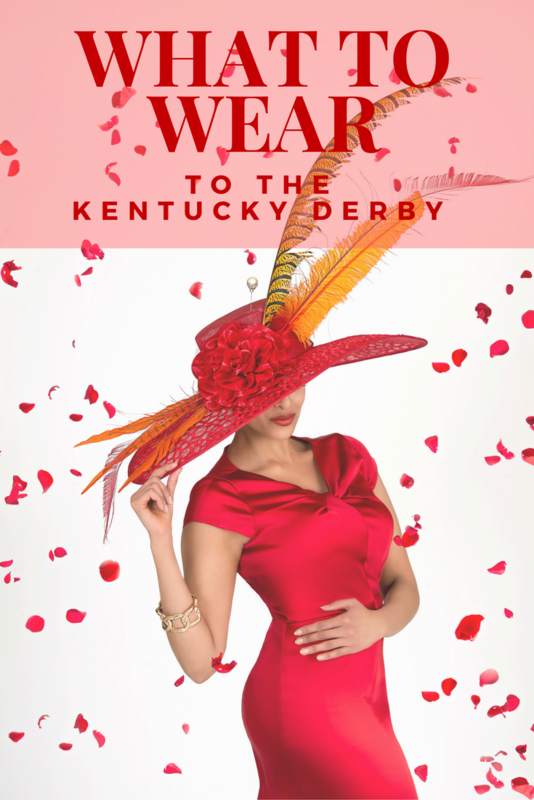 Check out store.fashionattheraces.com for some amazing designs. Everyone asks- do you get the dress first or the hat first?? Honestly- it does not matter. Whichever you find first and you love. You can always find something to match with enough time. DRESS: Be sure to have a gauge on the weather. Kentucky is a bit unpredictable when it comes to weather- we can have four season in one week…seriously. Keep an eye on the weather as you prepare for the weekend. As I began with the hat, you really want to make sure the dress is comfortable. Don’t go squeezing into something for ‘photos’ – there is a lot of eating, drinking, walking, sitting, bumping into other people etc etc. Be comfortable! Tea length dresses are my number one pick for the horse races. If not a tea length, be sure the length isn’t much more than 2 inches above your knee. Short skirts and dresses aren’t for the races. Keep the colors light and bright- floral prints are perfect for the Derby and Oaks. SHOES: I’m a heel girl myself- so you won’t hear ‘don’t wear heels’ from me. However, make sure they are comfortable! A block heel or a wedge can be a bit more comfortable than a skinny heel. Make sure you sole has padding and add more (Solemates or Dr. Scholl’s) if need be. Blisters can put you out for the entire day- don’t wear brand new shoes on the day. Make sure they are broken in and bring a couple bandaids just in case. If you don’t use them…you can be the hero to someone that needs them. Or grab my favorite product, Blister Blocker from The Sole Mates. You put this on the vulnerable spots (it is always my pinky toe that gets it the worst) and you won’t have any issues. PURSE: My worst nightmare is seeing a well dressed lady with some awful big bag. I am fully aware of the idea ‘you can fit everything in here!’ but when you are dressed up for the races….bringing your work shoulder bag isn’t adding any style to the ensemble. Bring a medium clutch that holds your essentials: money, lip gloss, phone, and whatever else you need but keep it simple. If you want to bring flats, try roll up ballet slippers that you can pack in the corner of your bag, or have you man stash in his suit.